MJJ Motorsports and rider Josh Corner have today announced they will return for a serious assault on the 2014 Motorpoint British Supersport Championship running to the new EVO class specification. The South Shields teenager, who turned 17 this week, will once again ride for this family-run MJJ Motorsports team powered by MSS Performance, on board a Kawasaki ZX6R machine. Corner made his Supersport EVO debut at Assen in September last year after starting the season in the Pirelli National Superstock 600 Championship, with a view to getting a head start on the technical regulations of the new class ahead of a full season in 2014. 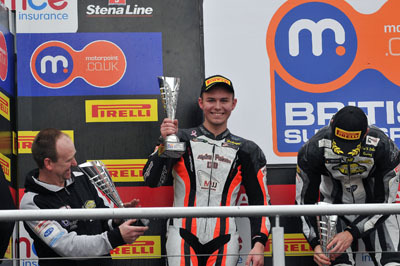 Finishing the year with a third place and his first Supersport Cup podium after a heroic ride in difficult conditions at Brands Hatch, the youngster believes he can be a serious contender when the season gets underway in April. “I’m really excited to be returning to the Motorpoint British Supersport Championship in 2014, since finishing the last race on the podium I’ve been champing at the bit to get back out there again,” he said. “As soon as they announced the EVO regulations last year I knew that it was where I wanted to be in 2014, so we took the decision to enter the last three rounds to get some early experience so we knew what we would be dealing with. “I’m confident that we can pick up where we left off at the end of 2013. We’ve put together a really strong crew and once again we will be working with Nick Morgan and MSS Performance to build the best bike we can to do the job. *The 2014 Motorpoint British Supersport Championship gets underway at Brands Hatch, Kent over the Easter weekend.